A very well attended meeting for our monthly Club Night. October is the month in which we mark the formation of the club and this is the 32nd anniversary of that event. It is also now our practice to hold our Annual General Meeting on this club night. Following the re-election of the existing committee the meeting agreed that we continue with our support for our existing two charities; the Dorset and Somerset Air Ambulance and Macmillan Caring Locally. Both charities had representatives at the meeting - to keep members abreast of their current activities and each to receive a cheque for £1000.00, proceeds of our Athelhampton day together with a donation from club funds. It was further agreed that we donate the proceeds of our Christmas lunch raffle to the Kidney Patients Association, this being to support two of our members who are presently receiving care for renal problems and in memory of a member who passed away this year from renal failure. 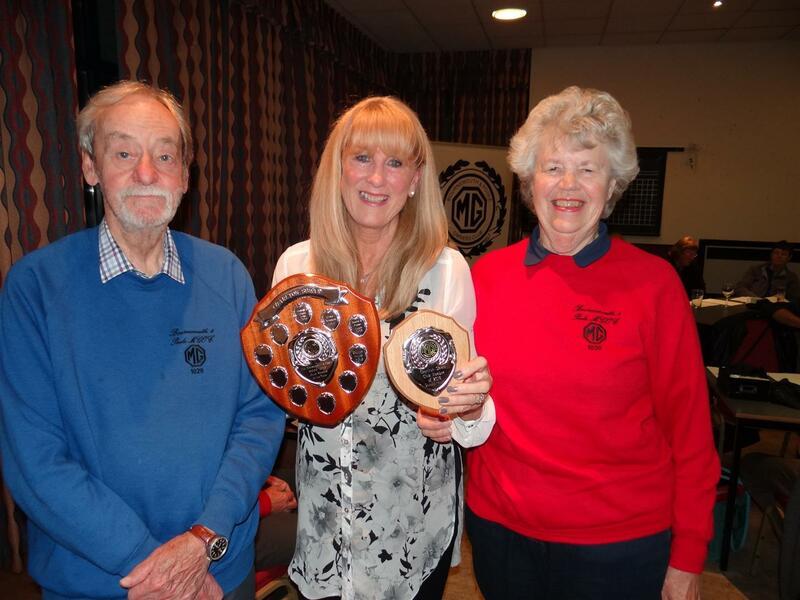 The award for Club Member of the Year was presented to Gillian Hales for her help with our monthly raffles and her continuing support for the club. After the closing of the AGM we were treated to slices of our traditional birthday cake and the evening was rounded off by a short quiz.